5pm, Friday 31 October: the end of another week. The only thing between me, my sofa, a glass of wine and an evening spent ignoring the local trick or treaters was my ride home. But, as pushed down on Eva’s pedals and set off across the work car park, I quickly realised something wasn’t quite right. Her back wheel felt alarmingly bouncy: what should have been firm and supportive was instead distinctly wobbly. With a sinking heart, I got off to inspect the wheel. Though I was pretty certain what had happened, I still gave the flaccid tyre a quick squeeze just to confirm it. 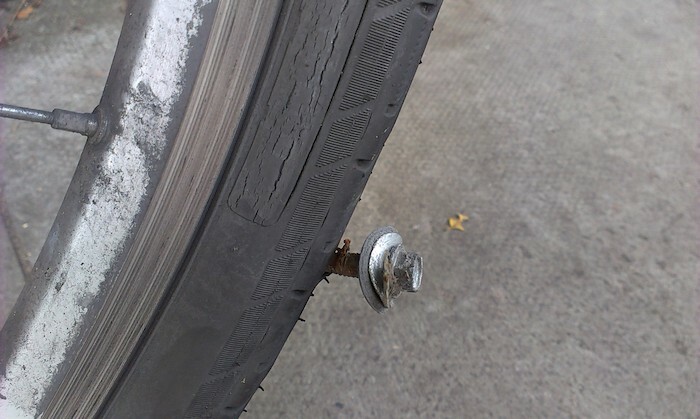 The universal law of punctures – closely related to Sod’s Law – dictates that your likelihood of developing a puncture is inversely proportional to your ability to deal with it. And so it was last Friday. The combination of a busy week together with never quite getting enough sleep each night had meant that, by around 3pm that afternoon, I had simply run out of energy. I’d spent the last two hours doing the editorial equivalent of treading water, occasionally leafing through various booklets to make it look as if I were doing some work. The last thing I felt like doing at that moment was wrestling with tyre levers, inner tubes and pumps. As I stood there in the almost empty underground car park, I weighed up my options. I could leave Eva where she was and worry about the puncture on Monday; I could walk her to the nearest bike shop and get them to fix it for me; or I could fix it myself. Taking her to the bike shop was undoubtedly the easiest option. However, fixing a puncture is one of the few things I can actually do on my bike. As such, it’s become a matter of principle that – on the few occasions when I get one – I fix it myself. It makes me feel competent and empowered. And besides, why would I pay someone else to do something I can do myself? Call me stubborn if you like, but there was no way I was taking Eva to the shop for a mere puncture unless I absolutely had to. Leaving her over the weekend was out of the question, too. Unless the puncture fairies paid her a visit I’d still have to deal with it on Monday – and there was no guarantee I’d feel any more willing and able then. No, I reasoned. The only thing I could possibly do was get it over and done with. After all, I carry all the wherewithal with me – pump, spare inner tube, repair kit and tyre levers – so I may as well get some use out of it. Though I can fix a puncture, I don’t get a vast amount of practice at it (the benefit of puncture protect tyres). As a result, I’m not very good at it. Add to that a general lack of upper body strength and a barely two-month old, very stiff tyre (the disadvantage of puncture protect tyres) and, well, I knew it wouldn’t be easy. The first hurdle was actually getting the wheel off. It took me the best part of ten minutes just to unfasten the brake cable from the brake arm. The struggle to get the tyre off the wheel ate up another ten minutes or so, during which a couple of my fellow cyclists came by to collect their bikes. Though I was grateful for their company, beyond making sympathetic noises there wasn’t a vast amount either of them could do. They soon headed off, and I was left alone in the car park. The next stage in the process went smoothly enough. I removed the old inner tube and tyre, and located the source of the puncture – an innocuous-looking staple* which had nonetheless managed to pierce through my almost brand new puncture protect tyre, creating a miniscule little hole in my inner tube. I briefly thought about trying to repair the hole, but decided it would take too long. So I got out my spare inner tube, inflated it a little and put it in place on the wheel. And then I tried to put the tyre back on. Dear readers, if you had seen me, you would have laughed. If I hadn’t been the one grappling with the tyre, I would have laughed too. Every single time I got the tyre on one side, it would pop out on the other. I tried pushing the tyre. I tried pulling it. I tried levering it. I tried wrestling with it. I tried squeezing it. I tried pressing it against ground. At one point, I even considered stamping on it. None of it worked. …And in it popped. At long bloody last. After that, I had just enough strength left in my arms to pump my tyre up sufficiently to get me home. And then, finally, I was on my way. I may not win any awards for my puncture fixing (unless there were one for longest time taken) but at least I’d done it all by myself. And if that didn’t earn me a nice big glass of wine, I don’t know what would. Poor you – but well done for fixing it yourself. Hope the wine tasted good. If the tyres are Schwalbe Marathons then I recommend watching a new videos on Youtube about how to fit them – there is a definite knack that once you are aware of makes them an absolute piece of cake to put on. Well done for fixing it. As you say, modern tyres mean we don’t get much practice at this task these days. I’m from an older generation and remember I would have at least one puncture per week, sometimes one per day, and on really bad luck days I would have two per day. In those days we got plenty of practice and became so quick fixing them that a puncture wouldn’t interfere with my average journey time, it was a minor inconvenience. The trick is not to bother taking the wheel off. I never understand why I see cyclists at the roadside with their wheel out. Just prise off the tyre on one side, pull out the inner tube, pump a tiny amount of air back in so you can hear/see the puncture, deflate again, stick the patch on, push the tube back in (valve first), push the valve (most of it) into the tyre cavity to allow the tyre to seat around the valve, snap the tyre back into place starting near the valve. Normally I can get tyres back on without resorting to levers – even with Marathons – do this by making sure it is well-seated into the recessed centre of the rim on one side and that will give you the maximum amount of bead to pull over the rim on the other side. Once you finally snap the last remaining bead over the rim then go back and seat it equally before inflating. Make sure the valve isn’t pulled to one side. Inflate, chuck your stuff back in your bag, check it is still inflated, ride home happy. Just one important ommission in your methodology! You negelected to mention running your fingers around the inside of the tyre to see if the culprit was still comfortably seated in the tread, ready to bite again after a few revolutions into your continuing ride! Old hands would know about this! My flats seem to occur in the dark, when raining and nowhere near shelter. Good job! I can usually. Change one in under 10 minutes, but I recall one that took over an hour. You are correct, it’s all about your mental capabilities at the time AND the cooperation of the stupid tire. Well done lady! I hope you had two glasses of wine! We all have our methods to fix a flat tire as you’ve surmised from the comments. First of all bravo that you did it yourself. Bravo for using puncture proof tires. Seems to me you’ve done all you can to eliminate the problem at the outset. I’m with baoigheallain on this one. If you are in a quiet environment, which I presumed you were, being the only one in the car park, then consider a different approach. If you can locate the source of puncture, either by pumping tires and listening for the PSSSt as you rotate the wheel, or by spinning wheel and examining rubber. The importance here is that by marking hole, you won’t have to remove wheel. On the other hand, my husband is more apt to do what Phil Lewis does, replace the whole tube. The problem with the later is you may be in such a big hurry that you forget to inspect inside of tire. The staple, glass, screw, etc. is possibly still inside rubber, just waiting to give you another bad day.